All of our automation systems are “custom” automation systems, engineered and built to our customer's exact specifications. We design and build custom automation systems for all types of applications, including assembly, joining, testing, inspection, parts handling, and much more. When you can't find a machine that meets your needs, let us build something to meet those needs exactly. The labor and downtime savings, combined with the production rate increases from our custom automation systems typically result in rapid ROIs. Dial-X Automated Equipment, Inc. has the experience and flexibility to meet your exact custom system needs. 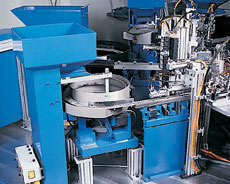 Custom automated products will increase your overall production rate. For further information or a free quote on custom automation systems, contact Dial-X Automated Equipment, Inc.